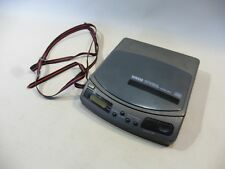 This is a collectors item made in March 1983 was one of the first Laserdisc players from Pioneer that was released to the UK market so is designed to play the PAL Laserdiscs. This was also the first model to have built-in CX Noise reduction. Grading System: Like New (M-) | Excellent (EX) | Very Good Plus (VG ) | Acceptable (VG) | Bad (VG-) | Very Bad (G) | Junk (Fair) | Junk (Poor). Heavy unit with minor marks and scratches around. Remote control for Denon Laserdisc Player. Condition is Used. No cracks or dents, perfect working condition. Original remote for Denon laserdisc player LA-2300, but could pair with many models. Model number of remote itself- RC-532. 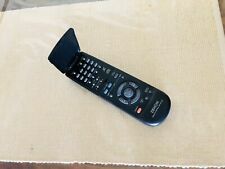 Remote for Denon Laserdisc Player. Condition is Used. Sent with Standard delivery. This could be used on many models of Denon players, I had it paired with LA-2300, but this is not the original remote for that player, belongs to some other model. PIONEER DVL-919E Laserdisc Player nice condictiones. power cable uk or eu plug. optical cable. This item has been tested and it does work. No cable is included in this sale, but both the channel 3 and 4 switch have been test and both sent signal to the TV. UNIT HAS BEEN TESTED AND WORKS FINE. A LASERDISC PLAYING IN THIS UNIT. THE LAST THREE PICS WERE TAKEN OFF MY PLASMA TV FROM. PAL - 220V. WORKING - ESTHETICALLY FAWLESS. FUNZIONANTE - OTTIMA ESTETICA. Im inneren müsste sich noch ein VideoDisc befinden. Der Stecker ist nich vorhanden. 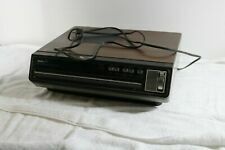 Verkauft wird einSylvania Video Laser Disc Player. Most of them, in this case, are useful. 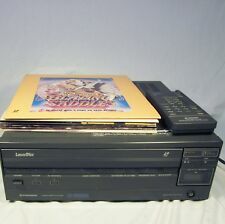 Besides the expected ability to play all forms of laserdiscs, the Prism will also automatically play both sides of laser videodiscs in succession; side changing takes only a few seconds—faster than any manual turnover. Pioneer CLD-1500 inkl.original Fernbedienung. Pioneer CLD-1500 Laserdisc Player. Das Gerät befindet sich in einem voll funktionsfähigem Zustand mit leichten Gebrauchspuren.Siehe original Fotos ! Player has minor surface scratches and works great. AC 120V 50/60HZ 48W. Manufactured April 1987. Yamaha APD-1 RF Demodulator. - RFD-1input : by coaxial cable (supplied) from an LD player's "AC-3 RF Out" jack. - RFD-1output : by coaxial cable and/or optical (Toslink) cable to an amplifier's "Dolby Digital In" or any jack that supports DD 5.1 the two. Tested and working. In good condition. Includes remote. Batteries will not be included with remote. Bis 0,5 kg. DHL Preisliste. 9 • Rest of the world. not available. L (< 31 kg). M (< 10 kg). S (< 5 kg). XS (< 2 kg). Pioneer DVL-909 High End Laserdisc Player - made in japan. Das heißt im Falle eines unverschuldeten technischen Defekts erfolgt eine Reparatur oder Austausch der Ware, dies gilt in jedem Land. 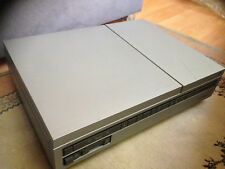 Laserdiscs können bei diesem Modell nur in NTSC abgespielt werden. I did take cover off and it did look very clean inside. 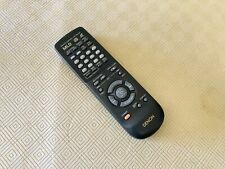 The remote does not have the back for battery cap,but does work.This item was never hooded up to a T.V. for FULL Testing so will Be SOLD AS-IS or for PARTS. Unit in very good condition for age. Tested and works perfectly. Working condition and fully functional. No remote. Pioneer CLD-D704 Dual Sided Play LaserDisc CD CDV Player with Remote Control. Video out #1 connection is not working. Testing was done on video out #2. Loading 12” LD may take more than one loading. Loading other media formats does not have this issue. All other functions in working condition. Has few cosmetic surface wear. Does not include TV or laser disc shown in pictures. 13 LD Titles. The Avengers / Deep Impact / Dante's Peak / Murder At 1600. Thanx in Advance! (Picture and sound quality are great. The LaserDisc draw functions smoothly. The CD draw opens and closes smoothly). PAL LaserDisc et les CD's (Plays UK PAL and US and Jap NTSC. LaserDiscs and CDs). PIONEER CLD-3760KV - ist ein professioneller Laserdisc Karaoke Player. Dieses Gerät kann Laserdiscs und CD's in NTSC abspielen. Das heißt im Falle eines unverschuldeten technischen Defekts erfolgt eine Reparatur oder Austausch der Ware, dies gilt in jedem Land. For Pioneer CD,LD Player etc. We have many parts of Pioneer LD player. Excellent working unit. i ran a dvd and a LD through it (the crow) thats all i have. flip feature works and it has great picture and amazing sound. it is hard to get pictures, because this unit is like a mirror everywhere. Up for sale is Pioneer CLD-V700 Karaoke LD/CD Multi Laser Disc Player. Fully Tested Great Working Condition. Wer sich auskennt bekommt es sicher wieder hin, LaserDiscs laufen einwandfrei. PAL / NTSC L aserdisc et les CD's (Plays UK PAL, US and Jap NTSC laserdiscs and CD's). Works great, plays laser disk/CD great. All features working great. ALL PICK UP WILL BE DONE IN PUBLIC PLACE. We are located in the CORAL SPRINGS/COCONUT CREEK/MARGATE AREA. Allow 24hrs notice before coming by to pick up your item. Somit einfach per Hand umdrehen dann läuft das Gerät einwandfrei. Das heißt im Falle eines unverschuldeten technischen Defekts erfolgt eine Reparatur oder Austausch der Ware, dies gilt in jedem Land.